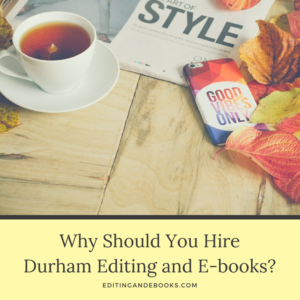 Why Should You Hire Durham Editing and E-books? We often do blog posts here on DEE about writing or editing, but we rarely get into the nitty-gritty of why you, as a writer, should hire Durham Editing and E-books to edit your book. Today, we’d like to touch on just that. First, every book deserves an editor. Before we get into why we would be a good choice for you, it’s essential for us to tell you that every book deserves an editor. When you’ve poured your heart and soul into a manuscript, poured over it for countless hours, and worked on it to the point that you feel like the characters are your very best friends, well, you’ve reached to point where an editor is your next step. The main reason for this is that you want your work to shine—whether it’s self-published or you’re planning to pursue traditional publishing—and that takes another set of eyes. It’s simply impossible to see every mistake when you’re close to your work. It’s also easy to overlook things since you’re so used to the story that you know it by heart… and this often leads to you not noticing places where the reader doesn’t. If for no other reason than this, hiring an outside editor is a really great decision for any writer looking to share his or her work with other people. Second, you need an editor who will work with you and not simply for you. It’s not enough to hire an editor. There are lots of people out there who will edit your work, but there are very few who will work with you, collaborate with you, and truly form a partnership with you. Here at Durham Editing and E-books, our goal is to become your writing partner. Many of our writers describe our editing process as like having a personal writing coach or taking a personalized writing class. We want you to grow as a writer, and that means working with you to show you how you can use what we’re doing in our current editing project with you in the future. We want editing to be meaningful, and we strive to partner with our writers throughout the editing process. Third, you need an editor who is honest. Listening to what someone else has to say about our work is not always the easiest thing for writers. We are personally attached to our writing, so it is easy for us to take criticism as a personal attack on ourselves. As such, there are plenty of editors who will avoid feedback to avoid the possibility of a negative review. Here at DEE, we believe that honest feedback is the best way for a writer to grow. We seek to be positive in our feedback, and we strive to offer more than just a statement of whether something works or not. We provide you with honest feedback and honest help, and we will continue to do that… even if it means that not everyone will want to work with us again. Honesty is who we are, and if that is important to you, then we think you’ll find us to be a great match. Fourth, we offer different levels of editing to offer you more freedom in the editing process. We live in the real world, and we know that not everyone has thousands to spend on editing. As such, we offer different levels of editing to help meet your budgetary needs. This is also a great thing since it gives you more freedom over how much you want us to edit. Some writers want their manuscript to be edited in great detail and desire more feedback, while others prefer only spelling and grammar be checked. We strive to meet you where you are and to meet your needs in the editing process. Fifth, and finally, we are reader-focused editors who will help your reader get the most out of your book. It’s easy to forget the reader when you’re writing, and that’s why it’s important to have an editor who is focused on the reader and the reader’s experience with the book. Whether it’s knowing which type of formats work best for the reader in a non-fiction text or helping you see where the reader might get lost in your plot, we strive to stay focused on the reader. After all, the reader is who is going to read, review, and help you sell your book… and every book you write after this one. Keeping the reader happy will help you grow your readership and sell your book. If you have any questions that you would like to ask us, or if you would like to hire Durham Editing and E-books for your next project, please contact us through our contact page. We look forward to the opportunity to help you, and we wish you all the very best with your writing journey.